This attractive cultivar ‘Ruby’ of the species C. bivittatus as pictured on the right, were just tiny tots in a 3-inch plastic pot when they joined our garden family in early 2006. Their unique star-like shape that resembles a starfish and the fabulous stripy colors of their variegated foliage fascinated and captivated us so that morning 3 years ago and still does! Looking so adoringly cute and pretty as they waited to be adopted, it was an instant attraction both ways as our hearts warm towards this impressive pair. Cost us almost nothing for these jewels, just RM3.00 and dirt cheap! You’re sure to fall in love with this stunning beauty that grows easily and is relatively fuss-free. Etymology: The genus name, Cryptanthus, is derived from the Latin word, ‘krypte’, meaning ‘hidden’ and the Greek word ‘anthos’, meaning ‘flowers’. 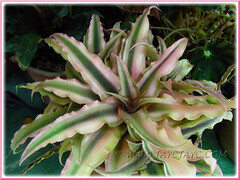 Plant type: Ornamental bromeliad that is popularly grown for its striking foliage. 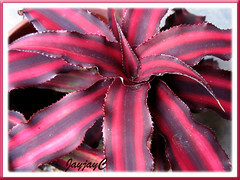 Features: Cryptanthus bivittatus is one of the most popularly grown species of the genus Cryptanthus that has over 50 species and more than 400 cultivars and hybrids as listed by the Florida Council of Bromeliad Societies. C. bivittatus is a terrestrial bromeliad that is low-spreading and slow-growing, reaching 6 inches (15 cm) in height. 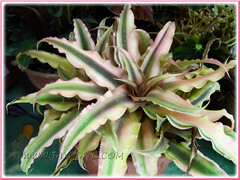 A smaller and petite species of the genus Cryptanthus with beautiful variegated leaves that are spirally-arranged in a flattish rosette that ranges from 6-12 inches (15-30cm) in diameter. The rosette formed by the colorful slender leaves with pointed tips, takes on a star-like shape that resembles a fallen star or starfish, hence attributing to its common names, Earth Star and Starfish Plant. An evergreen perennial that bears stiff and strong leaves which are elongated and lanceolate in shape, with undulated and serrated margins and bending backwards at the tips.The leaves measure between 2-6 inches (5-15 cm) long. They are attractively variegated with longitudinal stripes in a combination of 2 or more colors, ranging from various tones of pink, red to crimson or maroon, white to cream and light green to dark olive-green. That too, color changes according to the intensity of light the plant receives during growth, vibrant in strong light and dull in shade or low light. Leaves undersides are colored light ash-grey. A mature plant will produce a cluster of tiny 3-petaled flowers in white, which is nestled in the center of the rosette. Simply beautiful and showy against the coloured foliage. It will also produce offsets or pups (baby plants) readily from the leaf axils or from the base of the of the parent plant, to continue its generation and increase your collection. 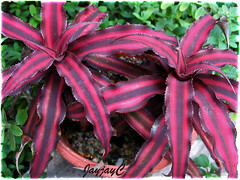 Culture (Care): Cryptanthus bivittatus grows easily with minimum care. 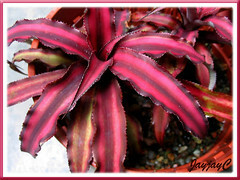 Given the right conditions, it will reward you handsomely with its stunning variegated foliage in fabulous colors. Light: Bright light indoors or full sun outdoors for best foliage color. However, extreme sunlight that causes bleaching or sunburn should be avoided and a filtered sunny location is much preferred. It tolerates low to medium light or shade, but colors will be less vibrant, dull or change altogether. Moisture: Medium water requirement and moderately drought tolerant. It loves humid conditions. Soil: Any kind of loose and porous potting medium, such as soil mixture of peat, sand and perlite that can hold moisture yet well-drained. Keep soil evenly moist but not soggy and never allow to totally dry out. Others: Foliage colors change according to the amount of light received. So, if their colors fade, relocate to a sunny or brightly lit site and move to a shadier spot with diffused light if foliage gets bleached. Grow them in plastic pots to better conserve moisture. Try not to overcrowd Starfish Plants in small pots that will either hinder the proper development of the root system which is their vital source of water supply or may prevent water from reaching the soil by its spreading foliage forming a tent above. It loves a humid condition which can be increased indoors by standing the pot on a tray of pebbles half-filled with water. Feed once fortnightly with a diluted strength of a balanced liquid fertilizer. Earth Stars are relatively free from pests or diseases, and very rarely bothered by scales and mealy bugs. For temperate regions: Hardiness: USDA Zone 10-11. More info at Dave’s Garden with flower photos. Best to grow them in containers that can be overwintered inside if necessary. Feed with a liquid fertilizer for flowering houseplants at every third watering from spring to fall. Propagation: From offsets or pups that appear from the leaf axils or at the base of the parent plant. To propagate new plants, remove the pups from the mother plant with a slight tug when they are at least one-third the size of the mother plant. Then insert the pup’s bottom stem tip into potting soil and firm the soil around it. It should root easily in moist soil and warm conditions. Usage: C. bivittatus will be excellent for container gardening, terrariums or grown direct on ground. Being an easy-care plant that is very attractive and tolerant of indoor lightings, it is ideal as a houseplant or ornamental plant for interiorscape in offices, commercial complex and others. Suitable too for greenhouses and conservatories, or use as an accent on window sills, patio tables and decks. Ideal for outdoors too in mixed planters, and as groundcovers in garden beds and borders with other low-growing plants for color contrast. Cyptanthus ‘Le Rey’, a cultivar of acaulis ‘Roseus’ is another exceptional beauty that fascinates us. Truly captivating with a broad central stripe in yellowish-green that sometimes has thin striations and bordered by baby-pink edgings. View its lovely features at the FCBS link provided below. 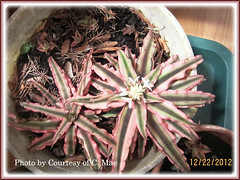 April 12 2013: We would like to offer our grateful thanks to Ms. C. Mae of Southeastern USA for her generosity in permitting the usage of her photos of Cryptanthus ‘Le Rey’ in this article. God bless you, C. Mae! 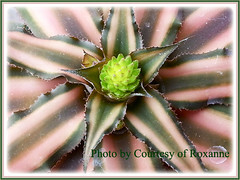 June 3 2013: Our grateful thanks to Ms. Roxanne of USA for her generosity in allowing the usage of her photos of Cryptanthus bivittatus var. bivittatus in this article. God bless you, Roxanne! hello there. 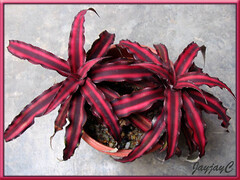 wanted to know if you could spare me a plantlet of “Cryptanthus bivittatus ‘Ruby’ “? my address is in Tioman Island, Malaysia. thanks. Sorry, Kevyn…we’re home-gardeners, not a garden nursery. Thank you so much for taking the trouble to inform us of the broken ‘Cryptanthus Online’ link and the Le Rey error. We’ve done the needful. Truly appreciate your kindness and God bless! correction; how much water and sun do my Crytanthus need. Hi Laurence! You can find the answers in the above article, under sub-items ‘Light’ and ‘Moisture’. Hi there.I am wondering where did u buy those lovely Crypthantus of yours.I have Crypthantus zonatus and brown Crypthantus bivittatus but not not those vibrant coloured ones.I have hunted everywhere in Penang nursery!! We got them from a garden nursery nearby in KL., Rianna. Sometimes we’ve seen them on sale at hypermarkets, like Tesco Extra or Giant. I am so glad I came across your website! 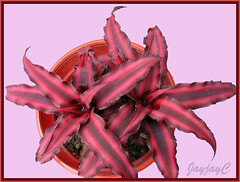 I have been growing Cryptanthus plants for YEARS and never knew what they were called. I picked one up at Home Depot in a small town in North Carolina, and quickly learned that they liked a lot of light in order to get that gorgeous pink color. I have more pups than I know what to do with, so I have made them my “official” house plant (along with a large aloe vera plant that the cat can’t knock over, they are the only plants I have in the house). I have an offer for you–I got some GORGEOUS photos of one of the largest plants blooming! It has buds that have yet to flower, as well as the tiny, delicate white flowers. I have to transfer the photos from my camera to my computer, but if you send me your email address, I’d be happy to share when I get around to switching photos between machines (the quality is quite good, too). I am sure you can find photos of blooms on the Internet, but in case you can’t and would like some good ones, please let me know. I raise a few worms for composting and fertilizing, and I would encourage you to do the same, as worm castings (AKA worm poop) is full of nitrogen, and we know how plants love nitrogen–it’s the world’s best fertilizer! You may be able to find some packaged castings at a gardening supply store or a “big box” hardware store that has a gardening section. The best way to get the goodness of the castings into the plant is by making “worm tea”. I use plain old coffee filters, put about a tablespoon full of castings into the filter with a long string tied around the top, and then let it steep in a gallon of rainwater for an hour or two. My pups and mama plants LOVE this form of fertilizer. It’s 100% non-toxic (use unbleached coffee filters), and it won’t hurt any other plant (or critters living in them) that you wish to water, either. 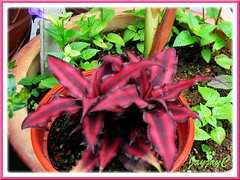 Siimply putting the castings in the dirt often will bring unwanted worms (they can live quite a while in their coccoons) or funky plants whose seeds either made it through the worm’s gut or somehow found its way into the bin where the worms lived, although they are easy to pluck out so your Cryptanthus can grow in peace. I also keep a humidifier going 24/7 for the plants and for me. Thank you again for giving a name to the treasure I picked up at a hardware store! I have so many pups, I may start my holiday presents NOW (March) by putting pups into small containers so they will be a hefty size after a long North Carolina spring, summer, and fall (and the larger plants which produce offspring are showing no sign of slowing down, either). I think it’s the worm tea, but who knows. . .
Great to know that you’ve finally ID’ed your treasured plant with help from this site, Cassandra… we’re happy for you! 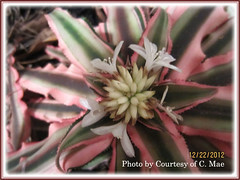 Yes, we’d love to have a blooming Cryptanthus photo to add to our article above. I’ll email you shortly with details. Thanks so much for the offer, Cassandra. Thanks too for sharing about using worm castings as a fertilizer. This is something new to us and others too may find your experiences helpful. A note about the worm castings: not all worms are created equally. Just as there are different species of cats and dogs, it’s the same for worms. The worms that do best are the ones used for composting. I have found that the hardiest and hardest working worms are from Uncle Jim’s Worm Farm (www.unclejimswormfarm.com), and they are the SUPER RED WORMS (as opposed to the regular red worms–different species). If you check out his blog under the Education tab, there is a fantastic article about brewing worm tea. It’s more of a medium- to large-scale operation, but worth reading, and it can be scaled down to a smaller project. Also, I may have extremely healthy plants (not just my cryptanthus family) because I always give them water that is free of chlorine. If it’s tap water, then I let it sit for a day or two in a used milk jug with a big hole cut in the side opposite the handle (the water can go in and out of the jug using the same opening, plus you’re recycling some plastic that would otherwise end up in a landfill). Even better is water collected from a rain barrel, as the pH is different, around 5.5; rain water and distilled water do NOT have the same pH! Plants are designed to drink water from the sky, so why not give it to them? Be careful not to let any water stand around unprotected by wire mesh, as mature mosquitoes will lay their eggs in it. Thanks for sharing your gardening experiences… definitely helpful and very appreciated. Btw, we can’t thank you enough for sharing the lovely shots of your blooming Cryptanthus ‘Le Rey’ and pups… just perfect to complement our article. Thank you very much and God bless! I just came across your website to find some care information on my Crytanthsus that has taken on a life of it’s own. I was reading posts from Cassandra and thought I could do the same for you in terms of pictures, as mine is in the “process of blooming”, which looks like a small pineapple in the center, then I noticed small tubulars, possibility small flowers or offsets, under each top leaf, under the bloom center. There are 5 of the tubular sprouts. 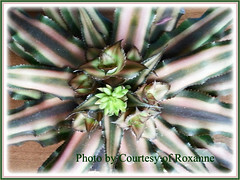 I’ve had and grown many, many genus of Bromeliads, however, randomly picked up this inexpensive plant not expecting much,other than the pop of color the Pink Star illuminates. Of all the plants in my extended collection,this one was the one I didn’t expect much from. I’m extremely surprised by the bloom and whatever lies beneath those leaves! My secret,I would have to eagerly tell you, is a family owned nursery that sells every type of plant and everything you need to be successful in growing and blooming indoor and outdoor beauties. They carry a fertilizer made by a company called Fertilome. They have a Bloom and Rooting Fertilizer that has brought stagnant Hoya back from their inability to grow etc. Fertilome is GOLD for all plants! If it’s okay with you,I would like to email you pictures of my Crypthansus as it’s in the blooming stage,along with showing you the tubulars it’s producing. I truly do not know what they’ll be,but it certainly was a nice surprise to see them. I wish you well with your Crytanthsus through this upcoming season! 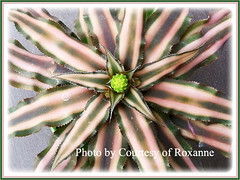 Yes, Roxanne… we’d love to take up your offer of pictures of your about-to-bloom Cryptanthus and pups. I’ll email you shortly with details. Thanks so much for the offer. Thanks too for sharing your gardening observations with this plant and introducing Fertilome. Roxanne, it was fabulous to read your post. This year, I got lucky again and had another plant bloom (they do indeed look like pineapples just before the flowers come out!). I also got a surprise like you did–those funky “half-moon” growths under the top leaves. I don’t know what your plant did, but a few of them on my plant turned into flowers. I THOUGHT they might turn into seeds, but I don’t know of any other plants of this type in my area with which mine can share some DNA; that doesn’t mean there AREN’T any plants, I just don’t KNOW of any. In general, my plants are thriving beyond my capability to keep them. I can’t give enough of them away to friends and visitors, as there are so many pups during the warm weather. This past summer, I put them on the western side of my screened in Sunsetter Awning “room” (you can buy a “screen room” to go under the awning–check with the company for details), and the combination of shade plus intense AND diffused light (thanks to the screening) gave me more pups than I know how to handle. I repotted almost everything for the winter, but I know I will have a big job ahead of me in the spring, as the pups are too close together at present to spread out and grow. I got more photos of the blooms, but since they look like the previous ones (with the exception of those funky growths under the top leaves–I took some pics of those), I can’t see any reason to send them. Jacqueline, if you want the photos, please let me know via text. Jackie, send a text to my email address if you want the photos of the truly unusual growths under the top leaves. Also, please let me know if you know of a market for these plants–I have about 200, and it’s Christmas Eve, so you know more are on their way. . . Happy holidays!!! Thanks Cassandra for sharing your gardening experience of this gorgeous plant. Sorry I don’t know anything of marketing them. Nevertheless, have a blessed, joyful and fulfilling New Year 2015. Great information! I received one of these for my birthday in October. It bloomed for me, and gave me two pups! My question is: will these produce pups more than once, or only when it flowers the one time? Thanks for any help. Hi Liz… thanks for your generous comment. Yes… it’ll produce pups more than once from the leaf axils or at the base of the parent plant. Hope this helps. May your plant continues to excite you.